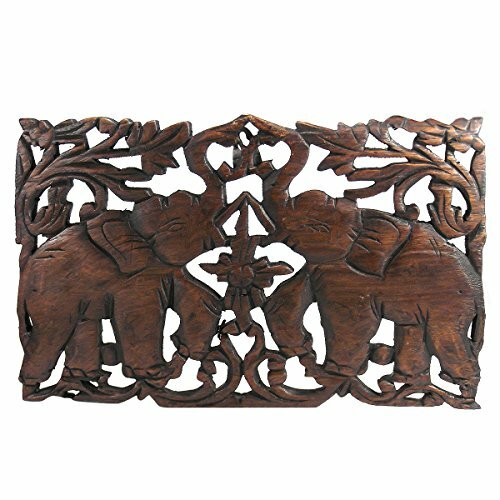 A pair of graceful elephant calves dance and hold their trunks high in this splendid Teak Wood relief panel. The calves playfully push their trunks together to test their strength. Artisan Thanat masterfully works with chisel and knife to achieve the fine detail that embellishes this piece. PLEASE NOTE: The handcrafted nature of this product will produce minor differences in design, sizing and weight. Variations will occur from piece to piece, measurements may vary slightly. Packaged in AERAVIDA branded environmentally sustainable packaging. < p>AERAVIDA works directly with gifted and talented Artisans from all over the world. At the core of our philosophy is fair trade and fostering a sustainable future for our Artisans.